Writing by hand makes a difference, so make sure your penmanship is excellent. I’ve written previously about the importance of using one’s digits to write in journals, take notes and, most importantly, send a handwritten note to a favorite client. But that handwritten note is just more junk mail if your client can’t read it. Back when business was conducted IRL, pens mattered. People carried a pen in their pocket to sign receipts, take notes, make corrections. Brands like Parker, Pilot and Scheaffer sold millions of ballpoint and fountain pens because pens were an indispensable tool of adult daily life. So penmanship mattered. Students drilled until their longhand was letter-perfect. There were entire schools for professionals dedicated to improving handwriting. People were proud. There were contests. Penmanship took a nosedive in the late 20th century as businesses started using desktop computers and word processors. But it was not the PC that lured us away from lettering. It was the smartphone. As soon as people could take notes with their thumbs on a magical device that never got wet, that never tore, that they didn’t have to file — and that allowed them to correct mistakes with perfect clarity in real time — as soon as smartphone apps, BlackBerries, Palm Pilots and tablets came on board, handwriting disappeared almost entirely. As new reports on the cognitive benefits of script are folded into the architecture of business practices and educational focus, people are rediscovering how to write. Thank Moleskin, as these iconic notebooks kicked off the recent decade of notebook mania and zapped life into the corpse of journaling. The EveryDay Carry and the Buy It for Life movements promote fountain pens and professional-grade pencils. You need a writing instrument to properly Bullet Journal. All of these new practices employ penmanship — and this has led millions of people to assess their chicken-scratch and perhaps find it lacks legibility. Handwriting isn’t all about cursive, of course. I finished high school with a focus on drafting. I practiced lettering day and night. I wrote in block capitals for the next 20 years. For a lot of people, classic handwriting is a foreign language and they’ll never pick it up. Their notes are printed, not written. Manuscript. This is the basic printing you learn in grade school. Each letter fits into a rectangular space and is not connected to its neighbor. Block. Block printing is manuscript but in a square and all caps. This is used in drafting to maintain perfect legibility. Italic. Italic is a kind of simplified cursive (but don’t tell the Society for Italic Handwriting that) with lettering that sits somewhere between manuscript and cursive. Cursive. The standard remains that loopy, vintage inky ululation known as cursive. Like a lot of people in the business world, I realized I needed to curb my calligraphy. First, nothing improves your longhand like actually writing in longhand. To get your graphology in gear, you’re gonna have to knuckle down and write words on paper as often as possible. However, you can formalize your training by adopting the practices of one of the many schools ready to beautify your ballpoint work. 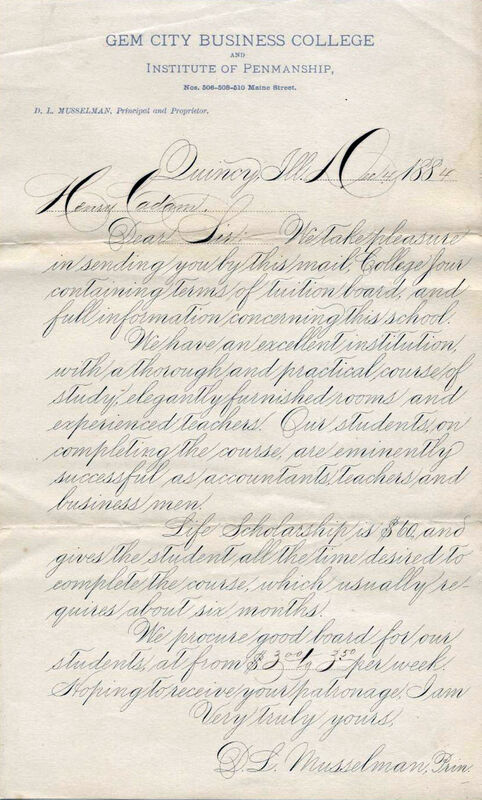 It’s the great-granddaddy of American handwriting since 1850. When you see a picture of a journal or a manuscript from just after the Civil War the penmanship stands out. Those gorgeously seriffed capitals, those elegantly drawn lines thicker in the verticals and thinner in the horizontals — that’s Spencerian script, developed and taught by Platt Rogers Spencer from around 1850 until about 1925. It’s the reason your great-grandmother’s recipes are beautiful. Learning Spencerian penmanship takes time and dedication. The results are an astonishing hand that would look perfectly at home on a fancy degree. (Nerds, take note: Your handwriting style is called your “hand.”) The pages of a journal filled with Spencerian script are museum-quality notes. This is the highest standard. If only someone could read it. Sure, it’s gorgeous, but Spencerian penwork is another language. Cursive already suffers from its removal as a requirement in early education. As recently as 2006, only 15 percent of students wrote their SAT answers in cursive. If you were born after 1975, anything written in cursive might as well be the Voynich manuscript. Since Spencerian was so hard to learn and was a little hard to read, Austin Palmer invented his own simplified version in the late 1890s. Palmer supplanted the Spencerian method because it was so much easier. Palmer’s perch over penmanship lasted for 60 years until it was discarded by the Zaner-Blosner school, which taught children manuscript before teaching cursive. Barbara Getty and Inga Dubay launched their method in 1979 and still teach handwriting today. Their Italic style teaches handwriting that is fast and crisp, whether one is printing or writing script. Like Spencer, Palmer and Zaner, they set out to create an improved method of writing legibly and quickly. Unlike the previous three, their method seems to work. The Getty-Dubay script’s most helpful quality is that the letters are the same when you’re printing or writing longhand. This is brilliant when you’re taking complicated notes or need to signify a book title or citation in your notes. As the writer, you transition seamlessly from writing in their connected cursive style to the printed form, then back again. As a reader, the difference between the two styles is hardly noticeable, yet visually distinct enough to clearly define blocks of differentiated text. When I started research for this post, I assumed Spencerian script was superior because of its stunning visual quality. However, after having spent a while developing a somewhat Spencerian hand, I’m abandoning it in favor of the Getty-Dubay school. Continuity of concepts. A study of first-graders concluded those who learned cursive scored higher for learning words and spelling than those who used print. The research seemed to indicate that the connected aspect of the letters in the words involved the brain holding the entire concept the word represented in their mind, where printing only asks the mind to focus on a single letter, not the concept as a whole. Left-brain, right-brain synergy improves. The act of writing script involves both halves of the brain because it is both artistic and logical. Lettering is drawing and drawing has been proven to put you in a better mood. When you type a word, you’re removed from the production. But when you put pen to paper, you are drawing the characters as sure as any calligraphist, as much as you might doodle a pastoral scene. Because this is a creative act, it changes your mindset, placing you in a more creative headspace. Combine that with the ideas you’re carving into the paper and you have a more charged mental reward for your efforts. Writing is creating and the more you create, the more you are used to being in the creative space. This may seem to be edging awfully close to new age navel-gazing, but science says write this down: The fluid movements of handwriting boost originality and creativity. In an increasingly virtual business landscape, you tend to pay more attention to the real. Handwritten notes, marginalia, even an idea hastily scrawled onto a Post-it stand out. By developing a style that is quick, crisp and legible, your handwriting will pop off the page. And if your notes stand out, so do you. How is your handwriting? Tell me in the comments below for a chance to get a handwritten card in the mail from your favorite Analog Attorney. Analog Attorney columnist Bull Garlington is an award-winning author, columnist and public speaker. He is the author of the books “The Full English,” “Death by Children” and “The Beat Cop’s Guide.” He prefers South American literature, classic jazz, Partagas 1945s, a decent Laphroaig, and makes a mean chicken and andouille gumbo. His company, Creative Writer PRO, offers top-shelf content for small and medium-size businesses. Follow him @bull_garlington.